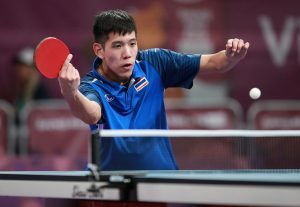 Currently busy at the 2018 Buenos Aires Youth Olympic Games, he will be back in action representing Thailand in the Mixed International Team event with colleague Jinnipa Sawettabut, the With The Future In Mind scholarship holder found time to answer a few questions whilst preparing at the Pre-YOG training camp in Shanghai. I am from Bangkok, Thailand. I’ve grown up there. It’s the capital city, and there’s lots to do. When and where did you start playing Table Tennis? When I was nine years old. I started playing at my school. In PE, we had to play Table Tennis. I kept trying to get the ball on the table, but I couldn’t do it. That made me find a Table Tennis club to practice how to play, and I enjoyed it. I train six days per week. I don’t train full time, because I am in the gifted program at school, so the mornings are for school and study, the afternoons are for Table Tennis. On Sundays, I have an extra training session in the morning, and then I meet my friends in the afternoon. So you are good at school and good at Table Tennis? Your parents must be proud! I am okay 🙂 Actually, my mom supports my studies, but then my dad says only studying is too boring, and I should play Table Tennis. Are you aiming to be a professional athlete? I am not sure about that yet. I expect university to be a lot harder than High School, so I will have to see how to manage school and Table Tennis then when I need to focus a lot more on my studies. I want to eventually go into Finance, like my mom, and she is encouraging me to do so, while my dad says I should stick with Table Tennis and find some combination of both that works for me. What did qualifying for the Youth Olympic Games mean to you? Was it a goal of yours? Yes it was. I started out as a Hopes player in the ITTF program, and I followed the pathway. So I went from Hopes player to the World Cadet Challenge to Rough Diamonds, and I also hold a With the Future in Mind scholarship. Now I am going to the Youth Olympic Games. So after that, it’s the Olympics. I feel quite proud for qualifying. I travelled to Paraguay to play the qualification and it was a lot of pressure for me. It’s far away from Thailand, and I had to fly for 30 hours, so I was quite jet lagged. Do you want to qualify for the Olympic Games eventually? It’s not easy, but I will try! How has your With The Future in Mind scholarship helped you progress? It helped me a lot, because it enabled me to attend some training camps and overseas tournaments in Europe that I would not have been able to attend otherwise. It has helped improve my Table Tennis skills, and I made friends from other continents – and across Asia. Roger Federer. He is still playing really well despite his age, and he is so strong mentally. He is always calm and doesn’t get upset easily. I am a really bad singer. It’s better not to invite me to Karaoke.